Are you looking for a workaround to play SWF flash format files on devices where flash player is not installed? Computer with no Flash player installed or no-flash support devices like iPhone, iPad – will not playback Flash SWF format content in its original format. You can easily overcome this by converting SWF flash content into HTML5 format. Further embed the converted HTML5 content as iframe and hence make it available for playback on modern browsers and devices that do not support flash player installation. 1. Open free Google Swiffy tool at Google Labs. This free online tool allows quick conversion of SWF Flash content into HTML5 to reuse Flash content on devices without Flash player. 2. Click Choose File button and browse to select SWF Flash file on your computer. Click to check terms of conditions checkbox. Make sure you do not upload Flash content whose copyright or right of usage is not held by you. 3. After selecting Flash file for the conversion, click Upload and Convert button. 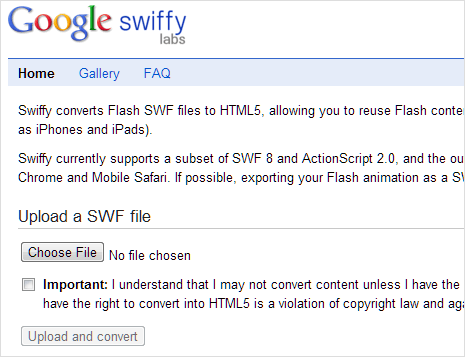 You can should get selected SWF flash file in HTML5 format. 4. Once you save the file converted HTML5, you can easily display it on webpage using iframe tag in the template source code. 1. Swiffy tools supports a subset of SWF 8 and ActionScript 2.0 programs. HTML5 output can be used on all Webkit browsers like Google Chrome and Mobile Safari. 3. Output of HTML5 format is little bigger in size as compared to size of original SWF flash file. Hence, file size increases when content is used in HTML5 format which has been converted originally from SWF flash format. 4. 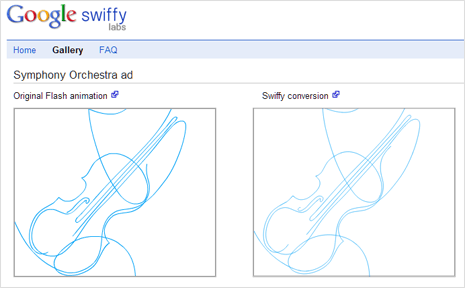 Swiffy tool supports many common SWF features such as vector graphics, embedded fonts, images and timeline animation. Though it is not yet ready for complex flash swf file conversion like that of graphic intensive flash games.